Introduced in 2003, the Canon FAXPHONE L170 is a low cost laser fax printer with additional printing and copying functionality. While it essentially has the abilities of a multifunction unit, it is very much a fax-centric device, and would be best in environments where most paper work is still done by the fax medium. A newer MFP may prove to be a much better value, especially in industrial environments. The fax machine measures 13.7" by 20.4" by 23" and weighs 24.7 lbs, making it fairly portable and lightweight and ensuring that it will fit comfortably alongside most other equipment, on its own table, or on a credenza. The fax operates based off of a 33.6 Kbps modem and transmits documents at a speed of approximately 3 seconds per page. It has 7.2 MB of dedicated memory, allowing it to store up to 450 pages. It supports 32 speed dials, 100 coded speed dials, and directory search, and can receive calls and faxes in fax only mode, fax/telephone switch mode, manual, answering, DRPD, and remote RX. It can perform group dials up to 131 destinations, but also delay transmission of a document up to 142 destinations and poll from up to 142 locations. A telephone handset is built-in. Fax send at a standard resolution of 203 by 98 dpi, but can be sent in fine (203 by 196 dpi), super fine (203 by 391 dpi), and ultra fine (406 by 391) configurations. The unit has a 250-sheet paper cassette capable of processing Letter, Legal, and A4-sized paper, as well as a 50-sheet, Letter-only automatic document feeder. As a printer, it produces documents at a speed of 19 pages per minute and at resolutions of 600 by 600 dpi or 1200 by 600 dpi. When copying or printing, it produces 19 pages per minute, close to but slightly below the standard printing speed of 20 pages per minute offered by many recent systems like it. The printer connects to computers via USB and supports Windows 2000, XP, Vista, and 7. Linux, Unix, and Mac OS X support are unavailable, and there are no third party drivers to make this unit work in any of those settings. This fax machine likely will not perform well as the sole system in an office environment. Its non-expandable 250-sheet paper tray will not meet the needs of even small offices that go through more than half a ream of paper daily without requiring to be refilled regularly, adding unnecessary downtime and frustration. Though it has an interface that would hypothetically allow it to do so, this unit lacks scanning functions. Furthermore, copies of irregular-sized documents are difficult, as the machine does not have a flatbed upon which to make more precise copies. 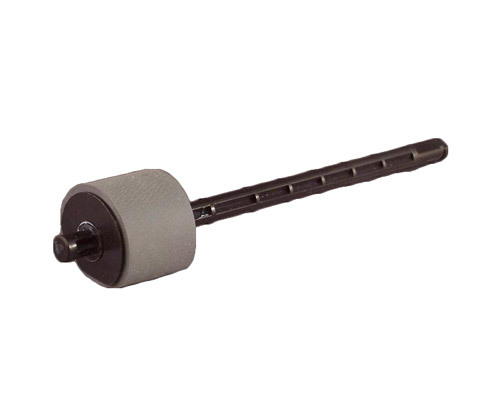 Some users report that long-time use tends to lead to the fax machine's rollers regularly crumpling paper. This fax machine also lacks the sophisticated paper sorting and handling options offered by newer machines. Duplex faxing, printing and copying are not available, nor are the sheeting, stapling and stacking options made possible through add-ons on newer systems. The printer does not include a USB cable. This isn't so much a con as it is a potential inconvenience, but it is worth noting. The unit also lacks a network interface or a means by which to add one. One will need to use printer sharing or an external printer hosting device in order to connect this printer to a networked environment. 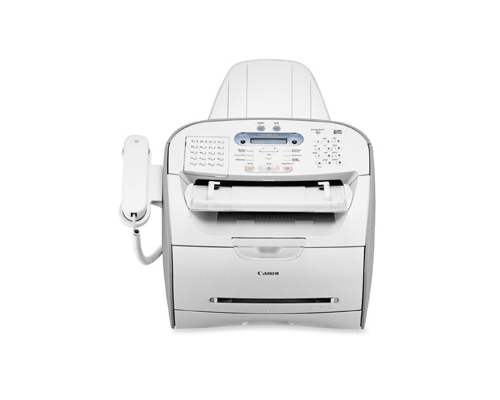 Review it: "Canon FaxPhone L170 "
The Canon FAXPHONE L170 has a low-capacity starter cartridge that will require replacement shortly after installation. Replacement cartridges for the L170 are rated at 3500 pages with an average 5% page coverage. 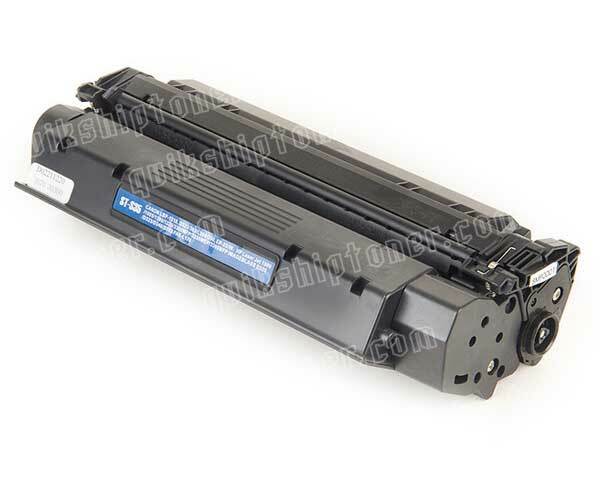 Like in HP and Samsung printers, the L170's toner cartridges have drum units built in, meaning that replacing one will replace both. This brings up the long-term cost of replacement parts, as both are always replaced simultaneously regardless of the wear across the two, but does mean that you will have less downtime as a consequence of replacing the unit's consumables.